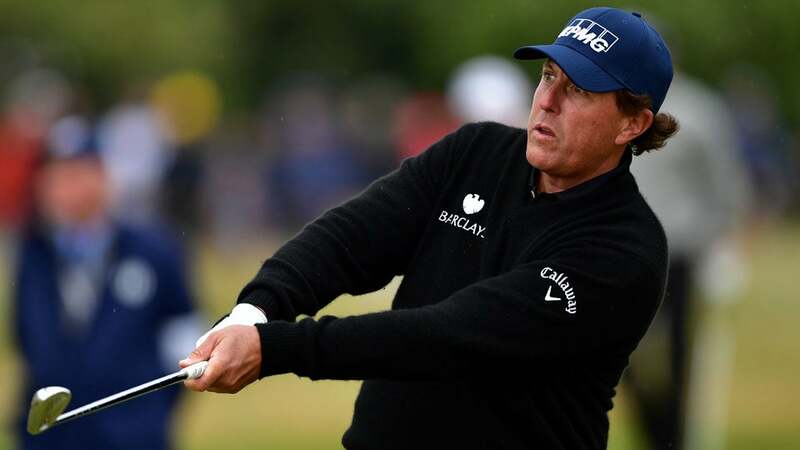 Phil Mickelson is seeking his first win since he captured his first claret jug at Muirfield in 2013. TROON, SCOTLAND — The wind wouldn't stop, and neither would Henrik Stenson and Phil Mickelson, who pulled away from the field in the third round of the Open Championship at Royal Troon. On a gloomy day that saw winds gusting to 30 miles per hour and greens going un-mowed, the 40-year-old Swede and the 46-year-old American traded the lead several times, but Stenson shot 33 on the difficult closing nine to post a three-round total of 12-under-par 201, one better than his playing partner. The Stenson-Mickelson pairing was essentially match play, as no other player mounted a charge. Bill Haas shot 69 and is at six under — good for third place, but still six strokes off the pace. Andrew Johnston, the bushy-bearded Englishman, was fourth at five under, with Americans J. B. Holmes (four under) and Steve Stricker (in a three-way tie for third at three under) barely in sight. That sets up a final-round duel between Stenson, a perennial contender and European Ryder Cup star who has never won a major, and Mickelson, who has won five. The weather forecast is for cool and windy conditions, but one assumes the R&A will send out a few blokes with mowers to restore a little zip to Troon's putting surfaces. This morning, not wanting a repeat of last year's Saturday at St. Andrews, which saw second-round play suspended for several hours because balls were rolling on their own, officials decided not to mow or roll Troon's already-sluggish greens. "I think they made the right call," said Rory McIlroy, whose opinion has been much sought-after this week, although not always well-received. "I mean, you don't want balls oscillating on greens, and you don't want the same thing that happened at St. Andrews. Obviously you want to get the round completed and done." Mission accomplished, but the Ayrshire wind still took its toll on a field trying to figure out a third weather profile in as many days. Troon's back nine, always a beast, has played differently by the hour, the par-4 11th alone extracting a number of triple- and quadruple-bogeys and a stroke average of 4.568. "Yeah, the back is tough," said World No. 1 Jason Day, whose solid round of even-par 71 left him tied for 25th at one over par. "I've got sand in my eyes still from the 18th hole." The back nine, which is a true inward nine ending at Royal Troon's clubhouse, provided most of the drama. Mickelson, genius scrambler that he is, finished a run of nine straight pars with an escape act that would have made Houdini proud. Having pushed his tee shot on No. 12 over the heads of spectators and under a gorse bush, he — Phil, not Houdini — invented a new swing plane on the spot, made a savage chopping stroke with a wedge, and bullied his ball up the fairway. He then trapped his third-shot approach so crisply that his ball spun back more than twenty feet from the back of the green. (When he rolled his downhiller in for par, the gallery responded with shouts of "Phil! Phil!") Mickelson followed with a birdie on 13 to reach 12-under par, two better than Stenson. The lead didn't last. A two-stroke swing on 14, where Stenson birdied and Mickelson finally missed a short par putt, put them level again — for one hole. Mickelson birdied the par-5 16th and seemed poised to sleep on the Open lead for a third consecutive night. But on No. 17, a par-3, Mickelson couldn't get up and down from off the green and Stenson drained a birdie putt for another two-shot swing. "I didn't have my best stuff," Mickelson admitted after the round. "I was a little bit jumpy, and my rhythm wasn't very good today." Both men had to scramble for pars on 18, but Stenson's mistake-free 33 gave him the day's-best round of 68 (same as Stricker) and his best chance to finally win that first major. "I know what I would like to see tomorrow," Stenson said, adding, "I know he's not going to back down, and I'm certainly going to try to not back down, either. So it should be an exciting afternoon." Mickelson's round of one-under-par 70 left him mildly frustrated ("I started to get a little bit anxious [and] that's not how I play my best") but in no way discouraged, seeing as how it's now just him and the Swede, characters in a movie jointly directed by Bergman and Tarantino. Only Mickelson wasn't buying the notion that the rest of the Open field would be off shooting B-roll with an assistant director. "No, not at all, no," Mickelson said at day's end. "I don't see that." But Stenson saw it. He said, "It was certainly kind of a match-play scenario out there," implying that — well, you know. Mano a mano.